Beak deformities in wild birds are unusual, with fewer than one in 200 adult birds thought to be affected. However, a number of reports from BTO Garden BirdWatchers have caught our eye and we are keen to find out more about the deformities being seen in British and Irish gardens. Please participate in our Big Garden Beak Watch survey to help us find out more! Here, a female Great Spotted Woodpecker with a crossed beak is feeding from fat balls in the garden of Geoffrey Coombe, Devon. Normal-billed Great Spotted Woodpeckers were also seen taking peanuts in Geoffrey's garden, but these were not eaten by this deformed-billed individual, perhaps due to a loss of precision in its foraging. Indeed, it is hard to imagine how this bird would have been able to strip and chisel at bark to find invertebrates or to access the seeds of conifers. This Collared Dove, which was filmed in the garden of John Sherratt, Derbyshire, has both mandibles elongated and decurved (downward curved). 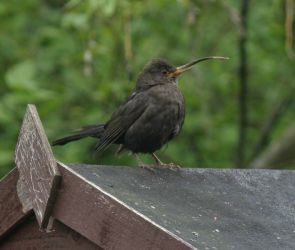 The foraging of this bird is impeded although it appears to be benefiting from a small trough of seed, meaning that less precision in its foraging technique is required. Collared Doves have not been reported very often with beak deformities through Big Garden Beak Watch. Interestingly, deformities have been seen more frequently in Woodpigeons.